Advertising is one of the most expensive elements in the marketing mix, whether print, broadcast or online. And because of the fickle and subjective nature of advertising, seemingly great ideas can flop, while unexpected approaches surprise even the most experienced marketers. With all financial investment at stake, it makes sense to gain insight into customer reaction. There are a variety of options for advertising testing. The extent of testing depends on the expected advertising budget-both ad production and placement. Clearly a $1.3 million Super Bowl spot requires more elaborate testing than a $20,000 print ad. So what are the advertising testing options? And when should you use one testing type vs. another? Most experts agree on two broad types of advertising testing: concept testing and copy testing. Concept testing is sometimes called pre-testing, and is generally exploratory using headlines, rough layouts or storyboards. Concept testing typically uses qualitative research techniques including focus groups or depth interviews to gain insight into effective ad concepts, identify problems or issues, or to generate new ad concepts. In contrast, copy testing evaluates different executions of an advertising campaign using finished (or close to finished) ad executions. Copy testing typically employs quantitative research techniques including surveys to measure recall or recognition. Larger sample sizes can provide a level of statistical validity decisions that may be important with larger investments. What’s more, you may use both types of testing for an important or expensive advertising campaign, using concept testing for the early stages of campaign development, and copy testing to select the final ad option. Finally, advanced copy testing using quantitative techniques can also involve physiological measures including eye-movement analysis, galvanic skin-response methods and brain-wave analysis. Although I will suggest these are too complex or expensive for most requirements. And what would a blog post about advertising testing be without an example of an actual ad test? 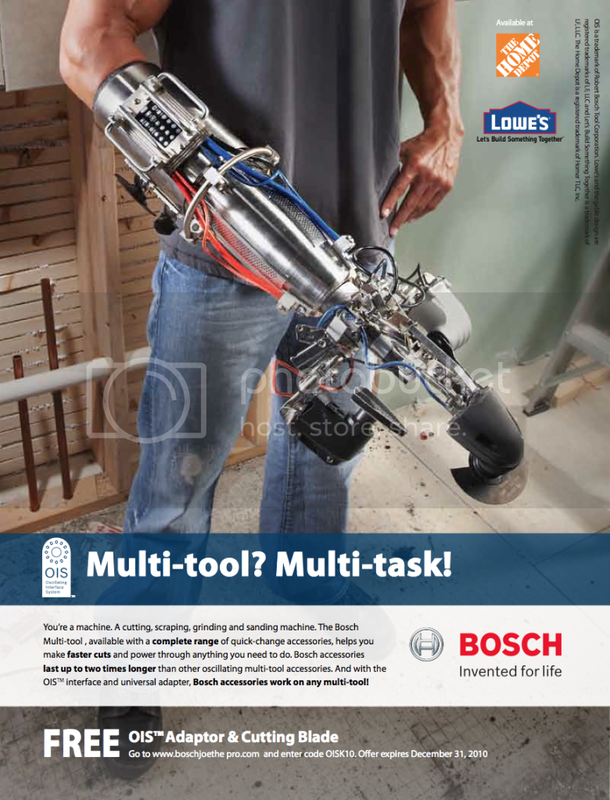 Earlier this year, Modern Marketing Partners conducted an ad test for client BOSCH Power Tools. 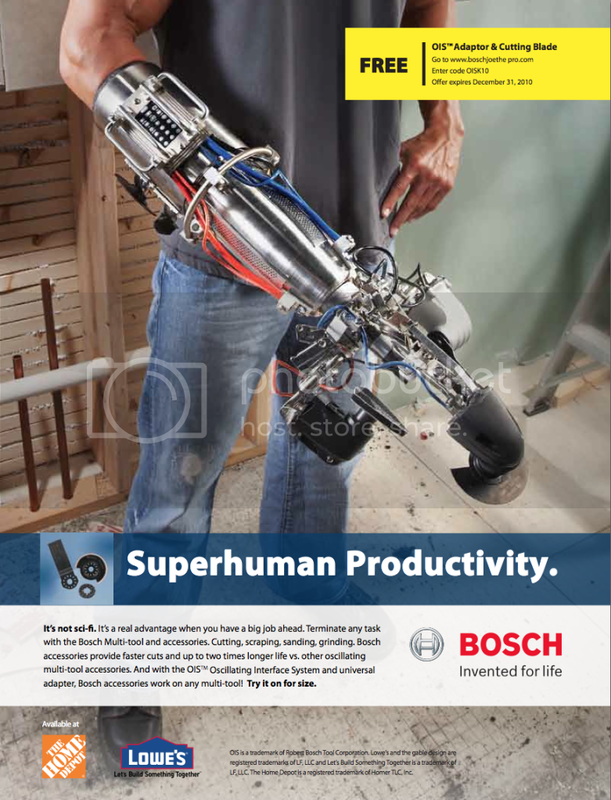 Per above ad testing types, this was definitely a copy test using finished print ads with a striking visual (ala Cyborg) and varying headline, copy and the treatment of the direct response offer. Which headline do you prefer most? Which headline would you stop and read? Which copy version do you prefer most? Which Free Offer treatment and layout position do you prefer most? The ad test was emailed to a random list of remodelers, the target audience from the circulation of Hanley-Wood’s Remodeling magazine. We received hundreds of survey responses making the copy test statistically significant, and most importantly, a clear direction with a large percentage of respondents selecting the “Maximize Your Multi-Tool” headline and copy. The preference for “offer treatment” was even more pronounced with nearly 68% preferring the offer in yellow, top right position (an unconventional offer position, and unexpected outcome). Do you have an ad testing experience you would like to share? As always, please comment, Retweet, Facebook Like and bookmark using the Share tools below.